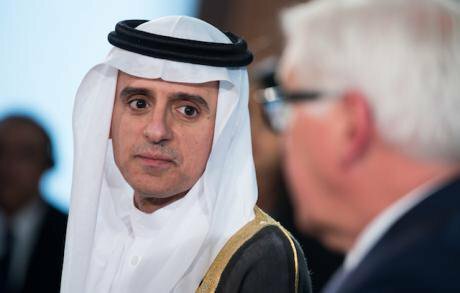 Foreign Minister of Saudi-Arabia, Adel al-Jubeir at a press conference after talks in the German Foreign Ministry in Berlin, Germany, 25 May 2016. Picture by Bernd von Jutrczenka/DPA/PA Images. All rights reserved. Saudi Arabia entered the 73rd session of the United Nations General Assembly (UNGA) in a combative manner. The Kingdom’s delegation did not arrive as representatives of a reformed country, despite over a year of aggressive rebranding efforts. Instead, Foreign Minister Adel al-Jubeir and his colleagues took to the podium in the face of strained relationships with Germany and Canada, and a U.N. inquiry into war crimes in Yemen. Last November, Germany’s then-foreign minister Sigmar Gabriel condemned Saudi adventurism in the Middle East. His ‘shameful’ comments —as Riyadh described them— came following the snap resignation of Lebanese PM Saad Hariri, who suspiciously announced his decision during a visit to the Kingdom. Saudi Arabia hastily recalled its ambassador in Berlin. Months later, economic ties were curtailed, and remained so going into UNGA. Just as asymmetric was the reaction to Canada’s support of Saudi activists. When Global Affairs Canada tweeted messages of solidarity with detained Women’s Rights advocate Samar Badawi, the Saudi Foreign Ministry issued an excoriating response, slamming attempts to ‘interfere’ with the Kingdom’s internal affairs. A slew of reprisal measures followed, including an ambassadorial recall, the cancellation of flights to and from Canada, and an ultimatum for Saudi students at Canadian universities to return home. A pro-Saudi handle on Twitter went so far as to insinuate 9/11-esque attacks on Toronto. Such was the backdrop over which Saudi and Canadian delegates met at UNGA. Of utmost importance, however, was Saudi Arabia stymieing a U.N. inquiry into human rights violations in the ongoing war in Yemen. The lives of thousands of Yemeni civilians have been rendered collateral damage in the Saudi-led coalition’s fight against Houthis. Most searing in memory is an airstrike on a school bus in early August that killed over 40 children. Any sound investigation would find the coalition guilty of war crimes. No wonder, then, that Riyadh strove so aggressively to prevent one: a diplomatic letter issued ahead of UNGA ominously warned that any support of investigations would ‘negatively affect’ trade with Saudi Arabia. Going into UNGA, the Kingdom’s record was far from spotless. Saudi diplomats, however, defended recent reactions towards western ‘meddling,’ and clearly did not hesitate to threaten countries in favour of greater U.N. scrutiny over Yemen. How did the West respond to such pressure? German Foreign Minister Heiko Maas expressed regret at UNGA for Berlin’s row with Riyadh, attributing the rift to ‘misunderstandings’. Pro-Saudi ‘electronic flies’ were quick to comment on social media, advancing an Arabic hashtag reading, ‘Germany apologises to Saudi Arabia’. Maas was purportedly ‘egged on’ by German industry that was hurt by Saudi Arabia’s retaliations. Germany’s rapprochement with Saudi Arabia came at the expense of western ally, Canada. Foreign Minister Chrystia Freeland appealed to a gathering of German ambassadors in late August, ‘hoping for support’ in defending Human Rights regardless of ‘consequences’. Yet Ottawa’s call for support was largely unanswered by Berlin at UNGA. Freeland, to her credit, rose above Germany’s fecklessness. The Canadian Foreign Minister made clear her country’s ‘particular obligation’ to women fighting for their rights. She also emphasised a commitment to those with ‘a personal connection to Canada’ —a reference to Samar Badawi, whose sister-in-law Ensaf Haidar is a Canadian citizen. Saudi Arabia expectedly shot back. In a speech to the Council on Foreign Relations, Al-Jubeir deemed Canada’s ‘lecturing’ tantamount to treating the Kingdom as a ‘banana republic’. But in a show of mercy to his Canadian counterpart, he added, “It’s very easy to fix. Apologize and say you made a mistake.” Freeland refused, asserting that giving in to such a demand would ‘strip Canada of its humanity’. Canadian policy has yet to reflect such resilience, however. A prime and effective punishment against the Saudi regime would be curtailing arm sales. Save for the scaling-back of an order of armoured vehicles from 928 to 742 —initiated before the diplomatic spat over concerns unrelated to human rights— Canada’s arm sales have carried on as normal. Critics have called for the deal to be totally scrapped in light of Riyadh’s aggression. Only time will tell whether Freeland and her government will match rhetoric with concrete action. The vote to extend the U.N. investigation on Yemen presented a clear example of the West’s ‘one step forward, two steps back’ manner of dealing with Saudi Arabia. Despite Saudi threats to cut off trade with countries in favour of prolonging the inquiry, the motion passed with votes from Canada and the EU. And in an interview with Sky News, UK Foreign Secretary Jeremy Hunt deemed Saudi behaviour in Yemen as ‘totally unacceptable’. He emphasised the need for a political process to resolve the conflict, as opposed to the Saudi-led coalition’s ‘military solution’. Such support, however, belies established western policy towards Saudi Arabia, specifically in the realm of defence. Minutes after Hunt criticised Saudi excess in Yemen —inevitably perpetrated, in part, by British jets and bombs—, he staunchly defended the £4.6bn in U.K. arms licensed to the Kingdom since 2015. Never mind that 63 percent of British citizens are opposed to arming Saudi Arabia; as justification, Hunt cited the ‘bombs that have not gone off in the streets of Britain’ thanks to Saudi counter-intelligence. “We’re different countries. We behave in different ways”, he added. Hunt’s German peers similarly embodied this contradictory stance. Days after UNGA concluded, news broke that Chancellor Angela Merkel had doubled arm sales to Saudi Arabia. This not only goes against Germany’s support of the inquiry, but broke a promise that Merkel’s governing coalition made earlier this year to withhold weapons from all combatants in Yemen’s war —a proposition that 80 percent of Germans supported. And Spain, who had previously canceled a sale of 400 laser-guided bombs to the Kingdom, reneged ahead of UNGA. In towing this hypocritical line, western powers are actively enabling the very human rights violations they seek to expose. The West must make up its mind on Saudi Arabia. Germany, Canada, Britain, Spain, and others cannot continue to give lip service to human rights in international forums while arm sales to a known war criminal skyrocket. Ending, or at least limiting, arm sales not only respects the view of a majority of Westerners, but is morally correct. Yemen stands as one of the greatest humanitarian crises of our time. As German arm sales to the Kingdom have doubled, cases of cholera in the Hodeidah region of Yemen have tripled. Save the Children estimates that more than five million children face starvation. To suggest that depriving the Saudi-led coalition the weapons it employs in Yemen would not help alleviate the suffering of Yemeni people is erroneous. Nevertheless, even in the face of public opinion and sobering statistics, the West has proved intransigent. A more direct, grass-roots opposition is needed. Concerned individuals should make more noise on social media: a veritable beachhead against arm sales has sprung up under the hashtags #StopArmingSaudi and #YemenCantWait. Organisations such as the U.K.-based Campaign Against Arms Trade and ACAT France are at the forefront of this movement, along with activists like Sam Walton and Andrew Smith. And, for an MP, reading a letter or tweet from a constituent is far more influential than another academic report. As these voices grow louder, it will be incumbent on their respectives to respond. Until that day comes, the stereotype of the U.N. as a place of empty rhetoric prevails.